WizKids announces a “Khan Exclusive” at GenCon for Star Trek: Attack Wing! WizKids has announced a “Khan Exclusive” available at GenCon for their forthcoming Star Trek : Attack Wing miniatures game. WizKids Games will release their new Star Trek: Attack Wing miniatures game at the GenCon gaming convention in Indianapolis, IN, The convention runs August 15—18. 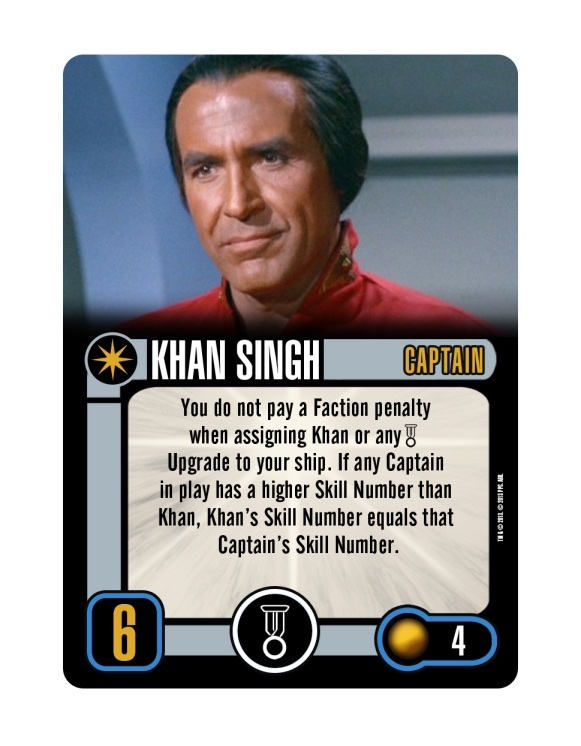 To commemorate the release of Star Trek: Attack Wing, WizKids will offer attendees a limited promotional Captain Card of Khan Singh. This card and its corresponding game tokens will allow players to assign Khan Singh as the captain of one of their Star Trek: Attack Wing ships. This “Khan Exclusive” will be included with the purchase of Star Trek: Attack Wing products at the WizKids Games booth and will also be available as part of the prize package for players who participate in Star Trek: Attack Wing mini-tournaments being run throughout the convention. Star Trek: Attack Wing utilizes the FlightPath maneuver system featuring pre-painted miniatures of iconic ships from the Star Trek universe. Assemble your fleet and customize your ships with different Captains, Crew, Weapons and Tech upgrades. The Star Trek: Attack Wing Starter Set — which includes the U.S.S. Enterprise-D/Galaxy-class, I.K.S. Maht-H’a/Vor’cha-class and I.R.W. Khazara/D’deridex-class ships as well as a rulebook and all the components needed to play— releases in August along with the first 8 expansion packs of two each of Federation, Romulan, Klingon and Dominion faction ships.